So when we last spoke to you, it was right after your Age of Fashion collection. Tell us what you’ve been up to since that time. There has been so much since Age of Fashion I can barely see straight! I’ve been working on a TON of Marvel products, as I’m obsessed. Also it’s not possible to have too much superhero fashion. There’s still so much more coming, too. But I’ve also been doing so much for WeLoveFine across their licenses. Star Trek, Star Wars, Adventure Time, Bee and Puppycat, Steven Universe, Dungeons and Dragons, Portal, I mean the list goes on. There are so many brands to play with, and they’re all so much fun! I’m like a kid in a candy store! It seems like there are a lot of geek related fashion collections coming out for the Fall, what do you think is leading that trend? Ok, so Disclaimer: I don’t really pay attention to high fashion trends; while I love NYFW and all, I really like fashion that’s attainable without breaking the bank. So the trends that *I* am noticing are unisex and oversize. It’s not only request we are getting from our customers, but it’s starting to hit boutiques and chains. And I brought it into this collection with some of the sweaters, which we photo’d on both ladies and gentlemen! And there’s an oversized button up shirt in the collection, too. My favorite trend is comfort, which I believe is always in season. A lot of fall trends are dominated by back to school, which is fun and all, but I’m an adult that hasn’t been in school for a bit so I wanted to focus on putting out pieces that adults can wear too. Like ‘Back to the Office’, which a lot of the Spider pieces will fit perfectly with. 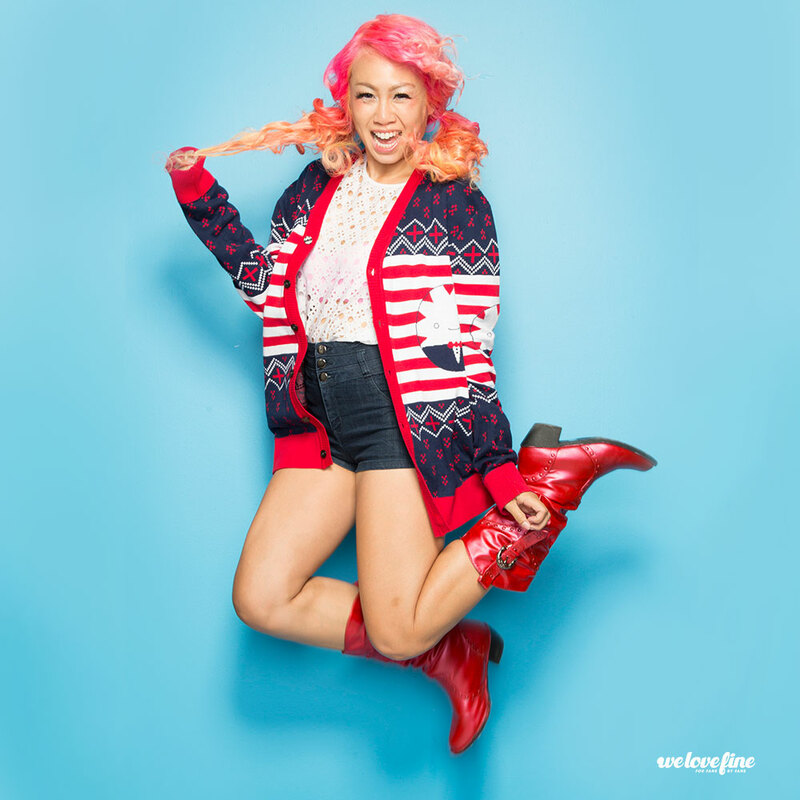 Given that Fall is right around the corner, did that influence what kind of pieces did you wanted to release? I see a lot of sweaters and long sleeve pieces, especially in the Adventure Time collection. Well, since I live in Los Angeles it’s always hard to prep for Fall, because it’s ridiculously hot here. But I love sweaters so much, and WeLoveFine has the most amazing geek sweaters (All thanks to Liz Khader, one of my coworkers and an amazing designer in her own right) so I can’t *not* design for them. The Adventure Time collection was sweaters partially because we knew it would launch near the end of the year but also because I just think everyone needs pieces that they can layer more easily. 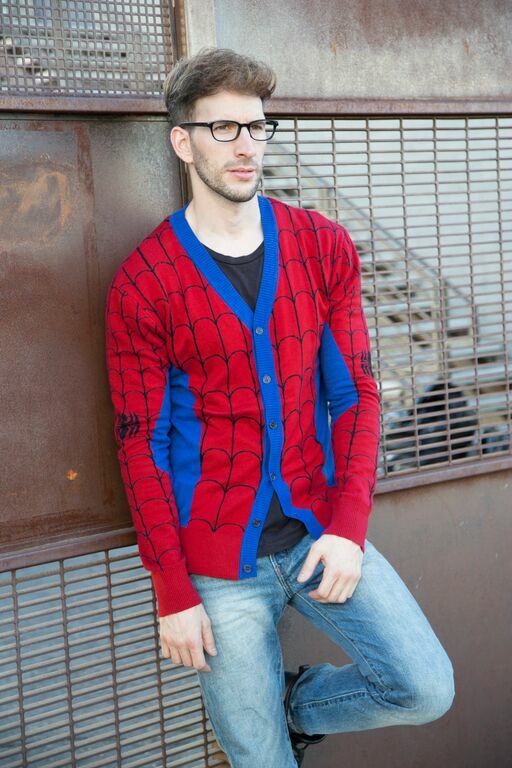 Also Cardigans are super classy, so why not geek-ify them and help fellow geeks elevate their wardrobe? But for the Spider-verse, the massive amount of sweaters was due to all of the feedback after the Spider-Gwen collection dropped! So many requests came in for Miles, Peter, Cindy, Jessica, and more Gwen of course. And I can’t just sit by and let requests go unanswered! So this collection is a bit of our answer to the fans. There’s still much, much more coming, too! 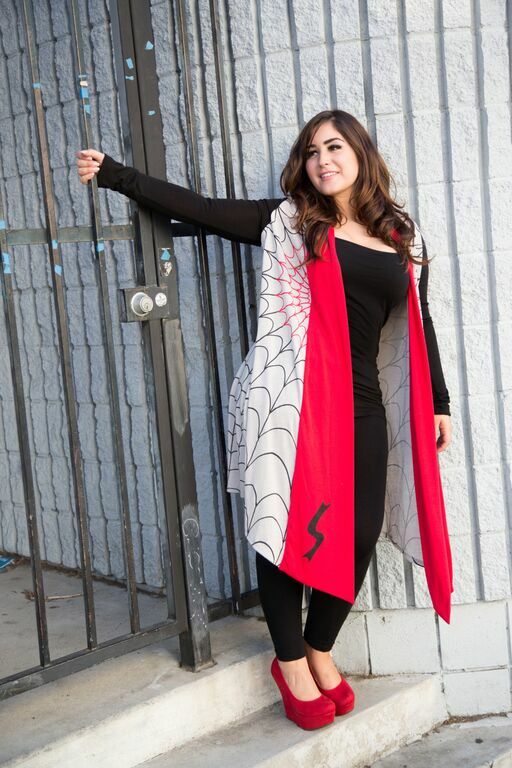 From the Spider-verse collection, we’re seeing more of that great dolman top you introduced in the Age of Ultron Collection, but we were instantly drawn to the moto jacket and the long open front cardigan. Can you tell us more about those pieces? OMG THE DOLMAN!! I had to do so much more with the Dolman because it’s just so versatile! The Spider-Gwen dolman is probably my favorite, because there are two layers of lace on the shoulders: Hot Pink under Neon Blue. To give the effect of her webbing. I’m such a dork. I love that so much. 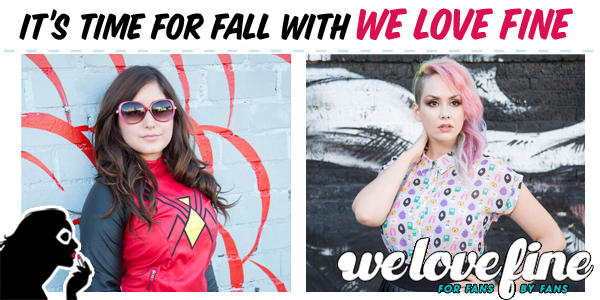 But the Moto Jacket and the Open Front Cardigan are brand new looks to WeLoveFine, and I’m so proud of them! The Moto Jacket is of course directly pulled from Jessica Drew’s perfectly modern look, and it has been SO hard not to say ANYTHING about this piece, as we’ve been working on it since May!! We have a huge Spider-Woman cosplayer in our department, Jessica LG (who also modeled it), who was a huge help in pushing this through. Anytime a sample arrived we’d just have her dote all over it and know it was great. 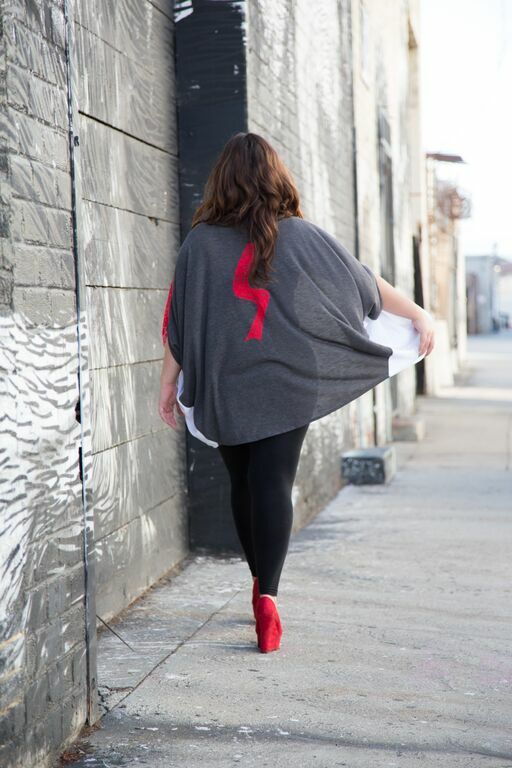 The open front cardigan is based on another one of my favorite persona pieces, like the dolman. I wear a few different colors of them, and when I was working on Silk ideas, I was wearing it and thought ‘why not’, her colors are so sleek and it’s such a great fashionable color blocking exercise, so I went for it. And after we photo’d it on Jessica, everyone was sold on it. You have to see it on to see just how sophisticated and fashionable the piece is. Was there anything in particular that inspired you to work on these two licenses, or did you feel like you had more to say, especially with the Spider-verse stuff? 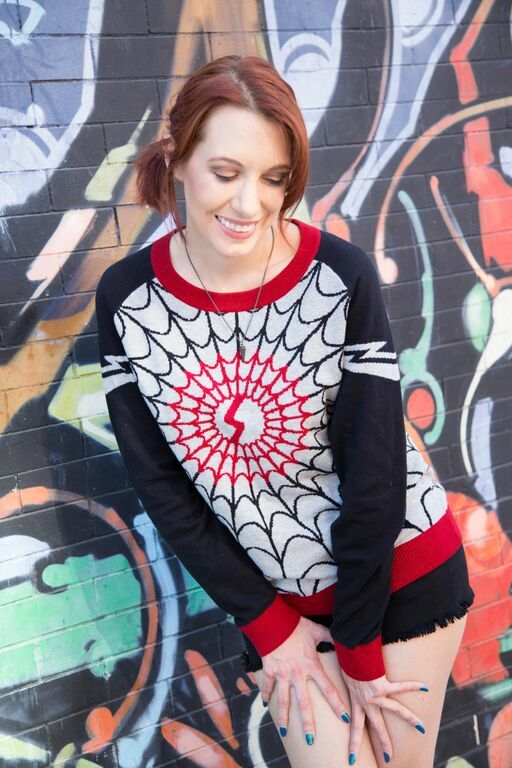 This collection was 100% due to the amazing feedback we had from the Spider-Gwen line. We have never really done much with the Spider-verse, but there were so many tweets and grams and comments about other Spider-verse characters, so pretty much the week after Spider-Gwen dropped I sat with the bigger Spider fans in our office and we brainstormed. The storm turned into a hurricane and that’s why there are so many pieces in this line. We also are doing our first ever legitimate pre-order with this line; we haven’t ordered any of these pieces from our factories, so the fans are going to be telling us in the first week of sales just how badly they want different pieces. And if something just isn’t moving, we aren’t going to proceed to making it. This also means there won’t be any ‘sold out’ pieces yet. This is the chance for our fans to really tell us what to order. And that was my way of getting so many pieces out; if we are letting our fans really dominate the conversation, then we should give them as much as possible to let them really decide what gets produced and what gets dropped. My hope is that we don’t drop any of this and it all gets made! Because, again, we can NEVER have enough Marvel! You’ve wowed us with multiple collections this year, any chance we’ll see any more before the year is out? Oh my god, thank you. There is a LOT more coming before the end of the year. There’s even more Marvel coming very, very soon. And some really great Trek that I can’t wait to share! I guess the year is close to up, which is crazy, but yeah, you’re no where near done talking with me yet. And the Jedi dress and R2 dress I designed got up onto the WeLoveFine site, which is awesome because they’re really the first foray into pockets for our dresses. And they’re getting great fan response!!! Lastly, can you talk more about the lovely people modeling your designs? I am in LOVE with my models!! To start with, I brought Anastasia back because she’s such a wonderful curvy model and really loves our products. She was one of the amazing stars of our Age of Fashion collection, too. I also stole Jessica LG from the office (ok, she may have MADE me use her because she loves Jessica Drew so much), but it was such a great choice because she’s such a phenomenal model thanks to all of her cosplay shoots!! I also have a huge crush on her because she’s just so adorable and selfless. She was so excited about the shoot that she went out and got all her styling together on her own. Michael Huffman is another awesome cosplayer, best known for his on point Gambit, but he was willing to show off his Spider love for us. He’s so sweet and funny, so it was a huge pleasure. And then of course Meredith Placko jumped in for a few pics because we can’t hold that woman back from our Marvel shoots even if we wanted to! She’s so involved with Marvel thanks to her show Marvel Movie News, and then all of her stunning Marvel cosplays, that we have to put her in pieces! And I’m glad she was on set, because our samples aren’t always the correct size, so when Jessica didn’t quite work for a piece, we could put it on Meredith and it would work 100%. I love having a variety of models and body shapes, because it really helps us show our fans how the piece look. And I would be a total jerk if I didn’t mention our photographer, Greg DeStefano. He’s far too accommodating to our crazy needs and always takes photos that are insanely beautiful. We basically took a shopping cart of clothes around the Arts District of Los Angeles and had our models quickly change into the different pieces to snap pics in front of the graffiti’d buildings, and he was so helpful in the whole shoot. He rolled with all our crazy requests, and I just adore him! Thanks again to Catherine for speaking with us! For the Spider-verse collection, click here to pre-order. And for the Adventure time collection, click here! We love that there is so much coming out to keep our wardrobes fresh for the coming seasons. Which are your favorite pieces? 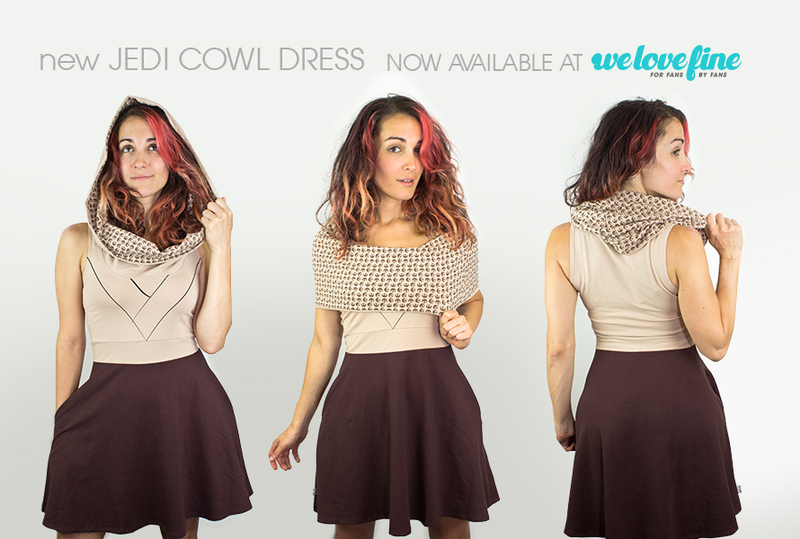 I loooove that Jedi Cowl dress. I want it so badly. The jedi dress is amazing!